On July 21, 2014, I published a blog post in which I recounted the long journey I had taken toward becoming an annihilationist. At that time, I declared myself agnostic concerning the nature of hell, although I believed that the Bible taught annihilation more clearly than any other of the alternatives. 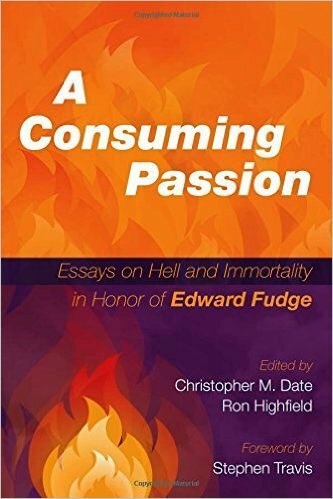 Later, I was asked to contribute my story for a chapter in A Consuming Passion. I was very happy for that opportunity because, by then, I had become thoroughly convinced that annihilationism is the clear teaching of Scripture. I was also happy for the opportunity to outline the process which led to my new understanding of the biblical data concerning the final state of the wicked. This morning, I received an email message from a man who had recently read my blog post, when it was recommended to him by a friend of mine. The best way for me to answer his question was to make him aware of the later development in my understanding. So, I excerpted from my draft of the manuscript I had submitted to the editors of A Consuming Passion, the section on “Stage 5” of my journey and I sent that to my inquirer. Having done that, I realized that other people were likely to come upon my blog post, thanks to web searches, and that they would be unaware of the slightly later, but quite significant, development in my thinking. So, I have published the more extended account of “Stage 5 of my journey” in the “Excerpts” section of “Documents” published on my web site. I have added an addendum to my original post to alert latecomers of the further developments. If you were interested in my earlier account of the journey, and if you have not been able to procure a copy of the book in which I brought the story up to date, you may wish to read the excerpt that I posted today. This entry was posted in Eschatology and tagged annihilationism, autobiography, hell. Bookmark the permalink.